We start estimates for season 2019. Please send us your contact info by our contact form to set date/time of the estimate. We all know, we have a terrible year with this crazy weather. We already lost almost two months of our short season, when we can actually seal the exterior wood. We don’t work, because we are the good guys. Take a look at our competitor, sealing the fence under the rain. Click to the picture to see a short video. If you’ve got the handrails on your deck painted it is not real good by our book, but it’s not the end of the world. Unfortunately, we can not restore it to beautiful natural looking wood. Our wood strippers will not work, because it designed for sealers and stains, and sanding will not work, because there is no way to get a sander down to every surface. – Get a good painter contractor. – Make sure, they prepare surface properly. They should pressure wash the handrails with house cleaner and bleach, scrub all pilled paint, then apply a nice paint, or solid stain with the color of your choice. – Make sure you’ll keep about a gallon of this stuff. If vertical will last about 8-10 years, top of the handrails will ware out twice faster. You’ll need to re-touch the top of the handrails sometime in the middle of this cycle. 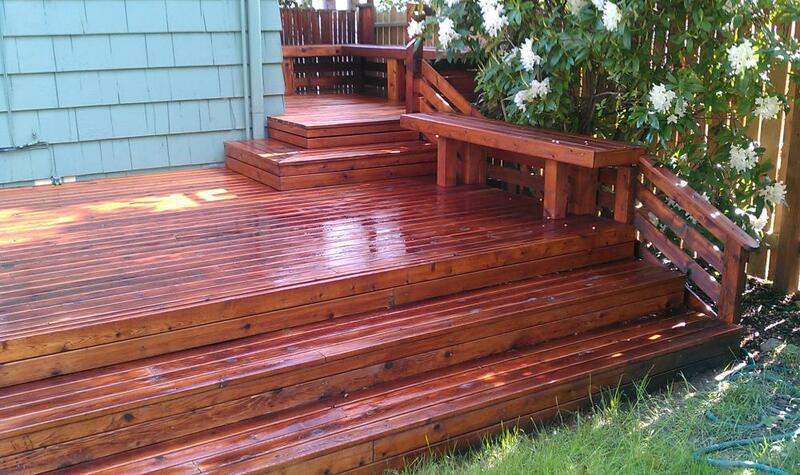 – And never ever use paint or latex-acrylic stain on horizontal surface of your deck. 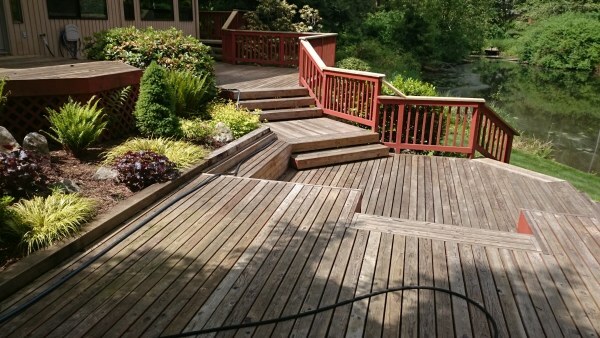 We love this deck at Mercer Island. Natural Cedar tone on clear cedar. Beutiful, isn’t it? 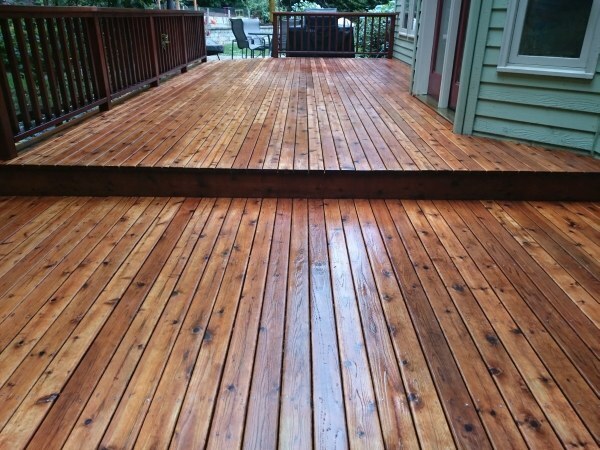 Exterior Wood Care, Inc, F/K/A Deck Plus Plus, LLC is celebrating it’s 10th anniversary this month! Hundreds of projects, hundreds of happy customers, great reviews on the Internet. We’re booked for a month and a half ahead, but there is still time to order our service. It’s very important to do the job right by the book. 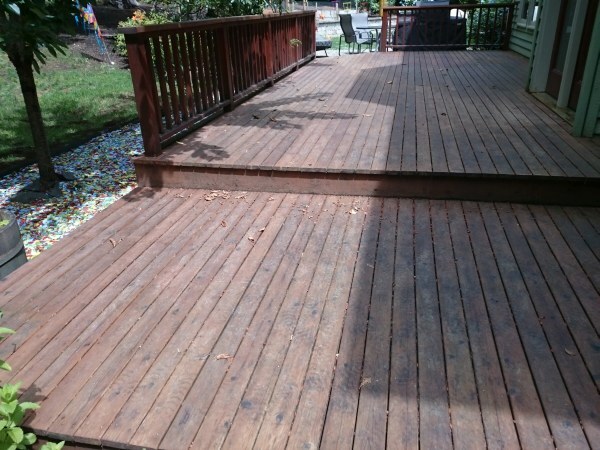 If it’s deck restoration, it’s even more important. We stopped any restoration projects on September 15 last year. This spring we had a couple of requests for estimates from home owners, who got in a little trouble after work was done too late in the last fall by other companies. 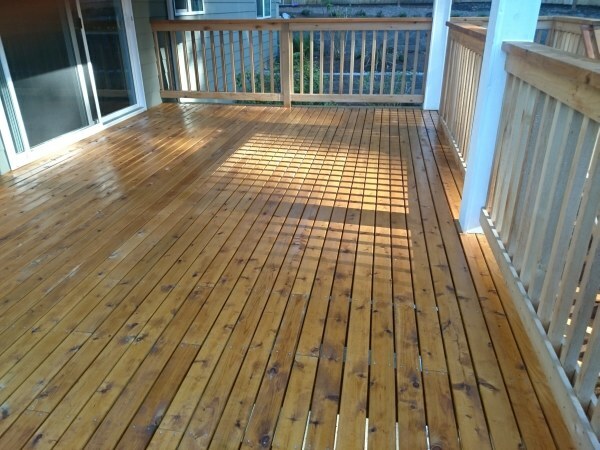 We start this season with a real cool project – restoring a deck after 5 years. It was a real pleasure to see how our sealer performs. 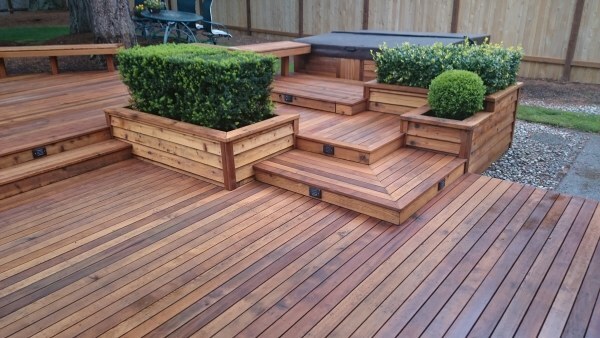 Summer of 2012 was the last year we used Cabot products on our decks. Cabot known as a great stain manufacturer for a long period of time. 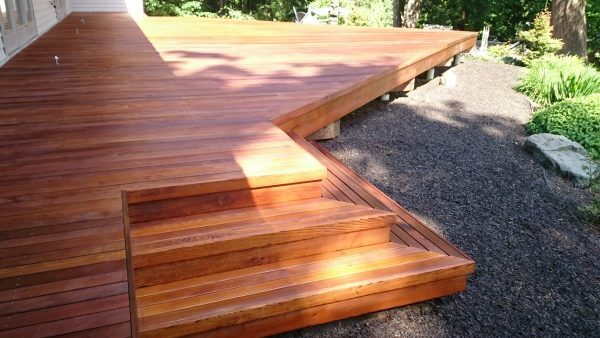 We used to use Cabot’s Australian Timber Oil on our ipe deck projects, because this sealer last longer on exotic hardwood, then other sealers. Cabot changed their formula again (they did it at least 3 times in last 7 years, probably to be VOC compliant), and Cabot’s ATO became a very difficult product to work with. Cabot’s ATO still shows best performance in our test lab, but after understanding that the application cant be done with best quality, we decided to switch to another product. To find out which sealers we use visit our Secrets page. Andre came out and gave us a quote of about $5800. 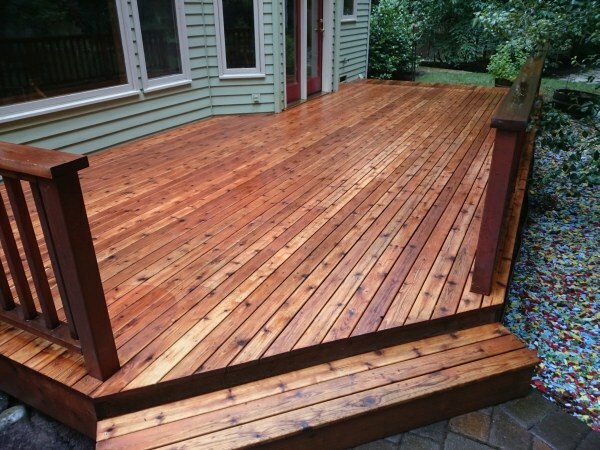 This would cover power washing our large deck including stairs, balcony and privacy slats; following would be sanding and staining. 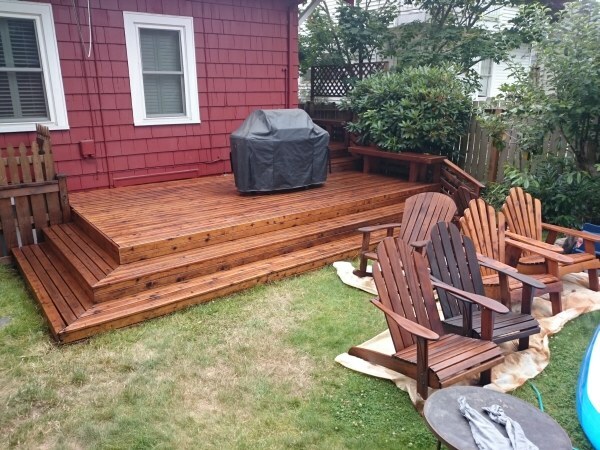 Andre also ended up washing and staining a side fence for free (he thought it would look better) and also replacing weak boards throughout the deck (upon request) which is why our final cost was higher than the quote. The job started out well enough, with us both understanding that the work would not start until the weather was dry enough. This arrangement was fine. After starting it did take a long time to finish, again because of the weather. Once things got under way, I had multiple problems. When Andre power washed the deck, tons of water came into our house. We have wood floors and I was not prepared for the resulting mess. When I mentioned the problem to Andre, he did not offer to help clean up or anything alone that line. He stated that if the seals are weak around windows or doors, water will come in the house. This makes sense, I just was not aware that our seals were broken. If Andre had simply stated beforehand that this might be an issue, I could have watched for it and been prepared to clean it up. Instead I had soaked wood, carpet and rugs to deal with. While power washing, Andre also covered all of our windows with wood coming off of the deck. I don’t know how preventable this is, but rather than just leave it to cake onto our windows, it would have been nice to have the windows covered beforehand or if Andre would have cleaned the windows after the deck was finished. Our balcony was power washed with such force that the paint was sprayed off of the flooring of the balcony. The power washing also sprayed wood debris all over our landscaping. It would have been nice if tarps had been set to prevent this and I can only hope that our heavy winter rains will wash the debris clean from the plants so they won’t have to be replaced. 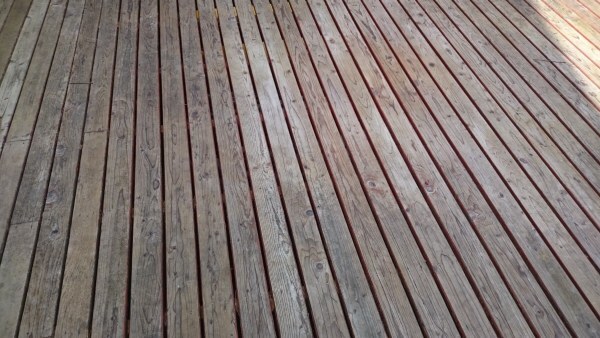 Andre said he sanded the deck but honestly it doesn’t look like it was sanded in a lot of areas. I wasn’t home to see if this was done, so I can only take him at his word. We also had problems with the staining. Not only is the deck stained, but so is a good portion of our house. There is stain spray all over the paint of the house from about five feet and down. It is also all over the windows. I can scrub it off of the windows, but I can’t get it out of the paint. Perhaps Andre is not aware of just how expensive house painting can be that he wouldn’t care to be more careful while spraying the deck. We also have stain marks on our concrete pad behind our deck. The stairs that lead up to our deck are not stained as dark as the rest, and part of the handrail never even got stained. Another part of the deck is much darker than the rest. 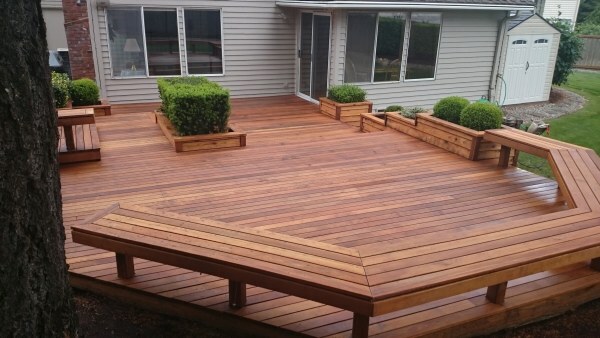 The deck was very wet with stain when finished. I had to wipe my feet off on something to prevent bringing stain into the house for quite a while. It took multiple weeks for me to no longer need to do this. When the deck was completed Andre insisted upon being paid IMMEDIATELY. I never really had a chance to inspect the deck as it was still soaking wet. He was unclear with me regarding when he would finish, and I was not home to hand over a check at the hour that he finished. I said I could mail it to him the next day, but this was not good enough. He decided he would camp out in our driveway until I got home. I found this to come off as very unprofessional, especially since the phone call beforehand, when I explained that I was not immediately available, Andre found it appropriate to hang up on me while I was trying to find a solution to the problem. I feel that if IMMEDIATE payment is such a big deal, then he should ask for half of the money up front or another arrangement. Andre insisted though that he didn’t want to be paid until the job was done, but then needed to be paid immediately. This provides a ridiculously small window of time for payment. Overall, I can say two things. Everyone says the deck looks better than it did but that it cost too much, but more importantly, I will NEVER refer Andre to anyone. I’m very sorry the water came to the house. We always work very carefully around doors and windows, if water find the way inside, it is not because a pressurize water we used, it would be the same effect if hard rain with wind hit the door. It might be a broken door seal or a big gap cause the leak. I always explain a possibility of water damage and recommend to put a towel or a rug under all doors and windows just in case. I might forget to tell it this time. We’re working on official declaimer which we will show to every client we start to work for. In 9 years being in business, it is the first major issue with client due to the water. After all I believe the damage was minimal, because the client didn’t make any claims to our insurance company. I would be happy to help with wiping water from the floor, but when we work on the project our working clothes is either very dirty and wet, or so oily and sticky, that you definitely don’t want us inside the house. I wouldn’t be helpful cleaning floor and made more harm then good. Normally, nothing or very little would be left on the windows, but the client had a large pergola covering part of the deck and connected to the house just above the window. We washed it at least three times during stripping and right after that. I saw some wooden fiber left, but couldn’t do anything with that, because we couldn’t use a window cleaner right after deck cleaning, it would change the pH balance and deck boards close to the window would become darker. I told that to the client, but I might did a poor job explaining that. Sorry, but it wouldn’t work. It’s like I explained to the client, the pressure washer makes a lot of air turbulence, and with water it’d tear off any protection film. More then that, we used gallons of chemicals above the window on that overhead pergola, and some of it would’ve find the way under the protection film, which create real problems for the paint on siding. …balcony was power washed with such force that the paint was sprayed off of the flooring of the balcony. If a contractor uses too much pressure, it leaves a pressure washer marks on the surface. Our equipment set to work on wooden surfaces, that means low pressure. We don’t leave any marks even on unprotected softwood. Clients balcony was faced south, and getting much more sun, then the rest of the house, and it peels much more, then on the other side, where paint was worn out too. Those paint debris would’ve be washed away with no pressure, or even with good wind. Here is no our fault. 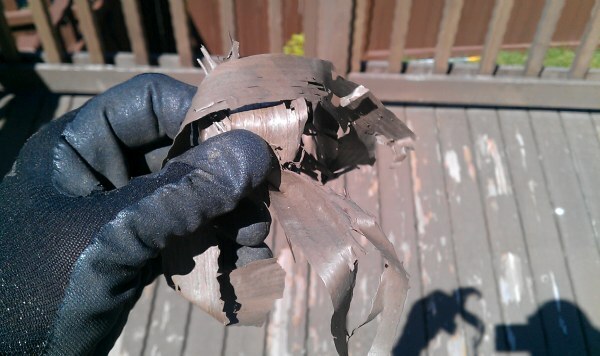 More than that, paint debris got to the wet wood and stick to it, if try to pressure wash, it could break the wood. We used a small hand sander before sealing to fix this and do thing right. I’m a little disappointed, that for our extra effort we got unreasonable complain. Sorry, but this is normal for such a project. There is no way to catch wood debris. It was a large project, so we had a lot of debris on landscape. It is not visible in a couple of months after the service. The rain, new grass and leaves cover everything. 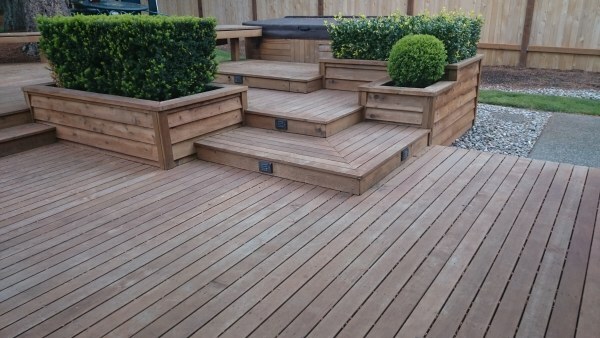 The fact, that the client didn’t mention any dead plants shows that we did a pretty good job protecting the landscape from chemicals. 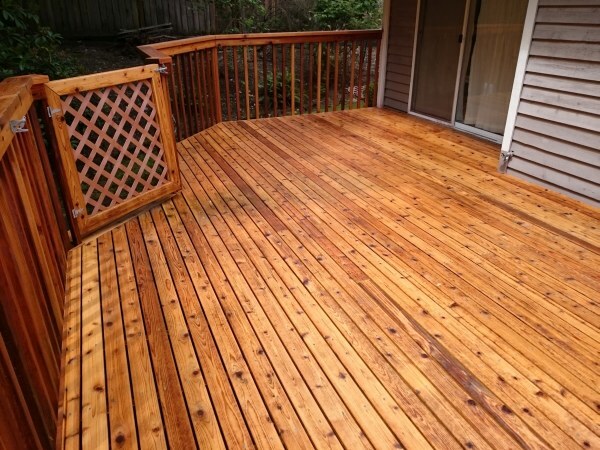 If the deck maintenance would be done more frequently, it would reduce amount of debris a lot. 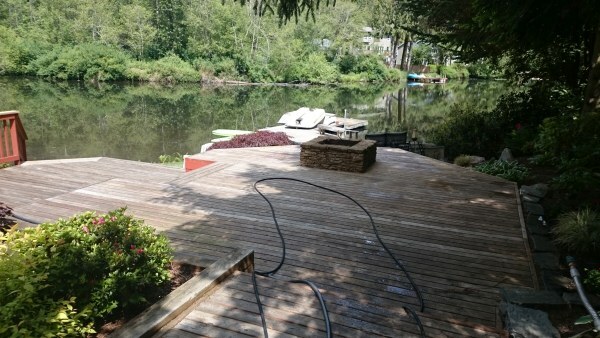 Yes, we performed light sanding/defurring on all deck and handrail tops, including new boards we replaced. 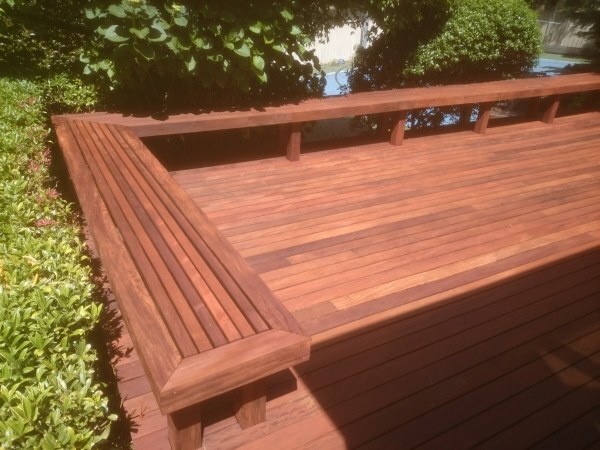 There is also deep sanding we perform, but only if we restore deck from acrylic-latex-varnish finishes. I explained in details the difference between deep sanding and defurring during our on-site estimate and after. 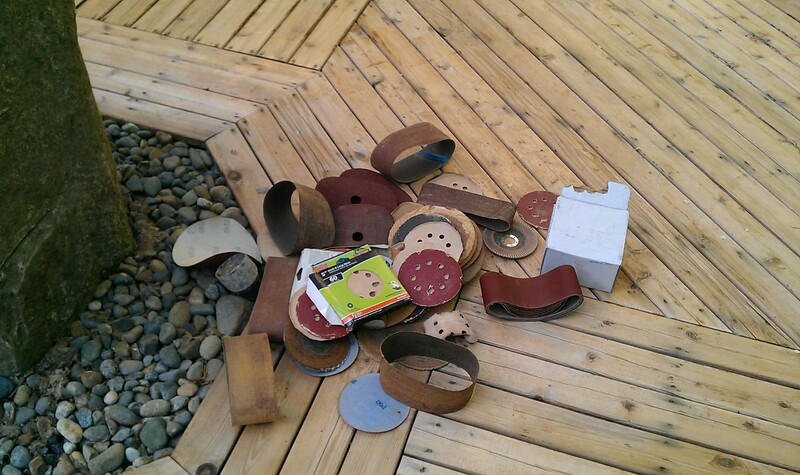 It seems like the client expected deep sanding on their deck? As a part of the project, we restored a very complicated fence, made as Venetian blinds, and hang over concrete patio. Our sealer has very high penetration level, even small drop spreads in a large spot, and it can penetrate almost anything. Working with such a product is very difficult to completely isolate the concrete, and small amount of oil got to the concrete surface. We use a very effective cleaner for concrete, we apply it enough, but it works slow, and I believe few spots on the concrete were visible by the time we finished. They should disappeared after awhile. I’m sure the concrete is clean right now. As I explained to the client, the stairs were made from a different type of wood, it will always look different, if semi-transparent sealer used. Clint should choose paint-like solid stains to have same look. I never heard about missing spots on handrails. Normally, if we miss a spot, client calls us, and we come back to touch up. Part of the deck looks lighter where we replaced deck boards, first few years it will look different, then it’ll become more even. This is normal and expected. We spoke about this during the estimate and after. This is how this product works. It’s stain, sealer and wood preserver in one. It slowly penetrates the wood and preserves it. I explained it a few times. Also I suggest, that some kind of rug needed at the entry to keep oil from getting inside the house. We always recommend to leave the deck along for some time. 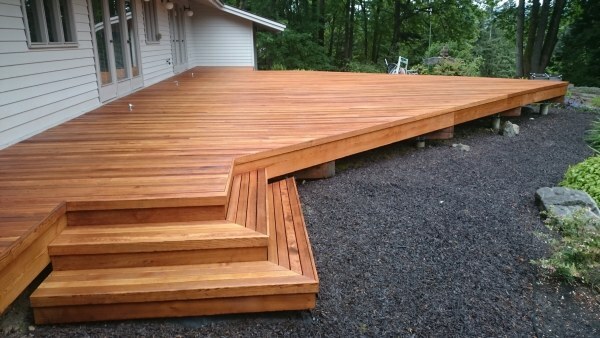 This client didn’t had any other access to the house, but through the deck. Most sealers on the market require 24-48 hours of drying time, and you cant walk on it during this time, our sealer allow to step on deck during dry time. I think, the client benefited more from our product, then that inconvenience. If this product could stop destroying the deck it totally worth it. I believe this is the main reason for all that not-to-be-nice review. Normally, we don’t ask for the money up-front. We think, it helps to build trust, and it’s more convenient for the client. We certain about quality of our work, and we can wait till customer will be fully satisfied. The first working day was July 11th, and the last – August 1st. We bought sealer, chemicals, gas for pressure washer, a lot of building materials for boards replacement. I’m a contractor, I work for living, we spend own money and wait for the project completion for three weeks, with bad weather intervals. I explained the payment requirement at the beginning. I remind her about the payment via email on 7/12. We wait a day before the last work day of the project, just because the client was still out of town. I told the client when I came in the morning the approximate time I’ll finish. And after that she left about 30 minutes before I was done. I was so upset, that I thought I’m not capable of to continue conversation on the phone. 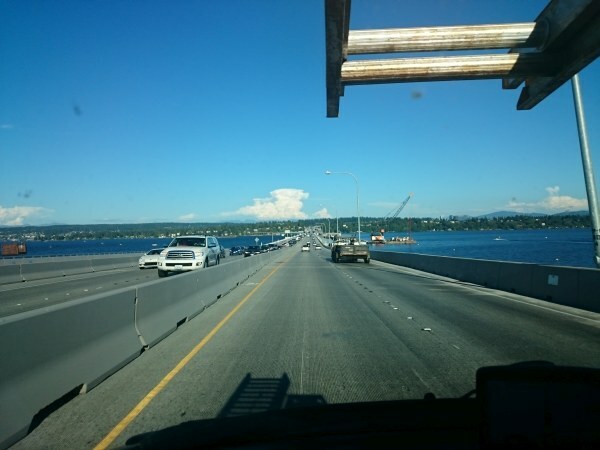 It’s hard to make an extra trip to Seattle during high working season to pick-up the check, it means loosing money. I trusted the client with my over $1500 money in materials and supplies and she didn’t even do one thing I was asking her? Do I look like a guy, who will run away with her check as soon as I’ll get it? Now, should I trust her? Will she send payment today or in a couple of weeks? I have kids to feed and bills to pay. Hope, it make sense. A few words about how big and tough the project was… There is a 1200 sq.ft. deck almost around the house, 60 feet of fence in Venetian blinds style with pergola on the top, another pergola covering large part of the deck, 180 feet of handrails (24 feet is on second floor balcony), large porch, long stairs to the street, two gates on the side. The deck boards were in terrible condition, they were eaten by the dry rot from underneath. I suggested to take a quote from building contractor to replace all deck boards. 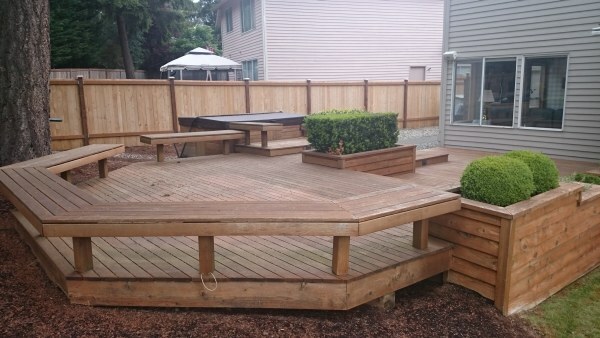 The client came back to me because rebuild the deck was too expensive. And we saved that deck. 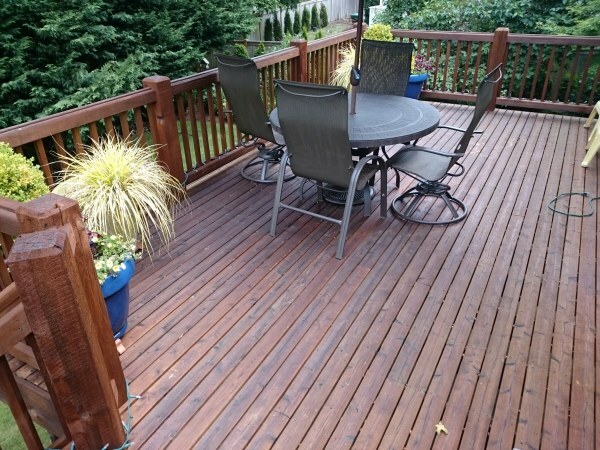 With proper maintenance, using the same sealer we use, the client may enjoy this deck for many years. We burned on that project big time, we spend much more time that we expected, but with our understanding of loses, when we find a few more boards needs to be replaced we did it with no extra cost. 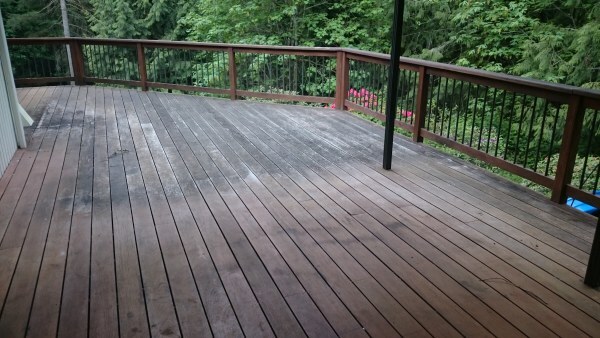 We stripped some ugly white paint from the fence facing to the deck and stained it for free. The client liked it so much, that asked to strip the rest of the paint, Unfortunately, we were done with chem washing at this point, and painted fence was too close to the neighbors house. That remark from the client: “he thought it would look better” doesn’t look like “thank you” to me either, but “F” for our service? Seriously? We’re doing 4th maintenance in 8 years on this deck. The homeowner loves our service, and doesn’t look for any other options. 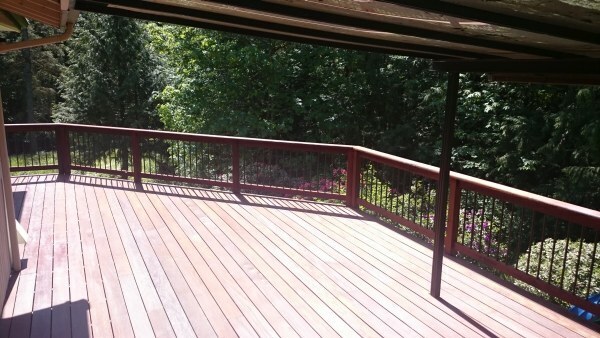 We maintain this deck in Natural Cedar tone, which gives a light fresh look. I remember the shape of the wood when we got there for the first time. The deck was sick, the fungus was starting it’s deadly work, slowly eating the deck. We replaced 2 boards at the beginning, and didn’t loose a simple deck board after that. I’m sure, if we continue regular maintenance, replacing the deck boards will not be an issue. 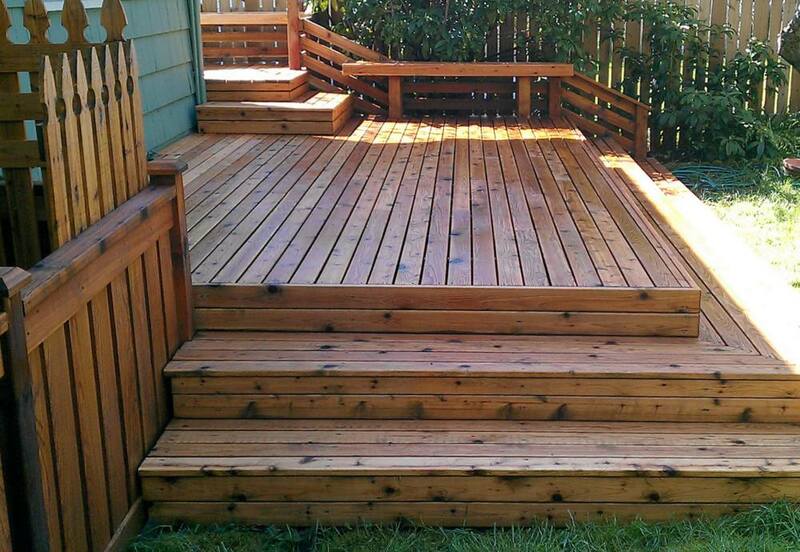 BTW, this deck is under a lot of stress: big trees around, and a lot of moister. This is a real good test for the sealer we use. This is probably the worst thing you could do to your deck: Painting. 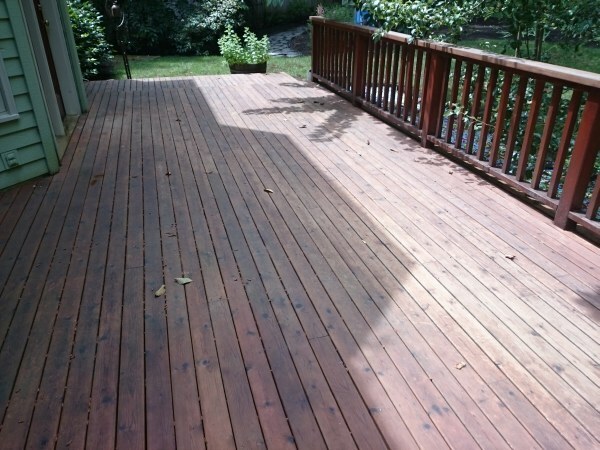 Painted decks are difficult to restore, because strippers we use designed to strip stains and sealers. 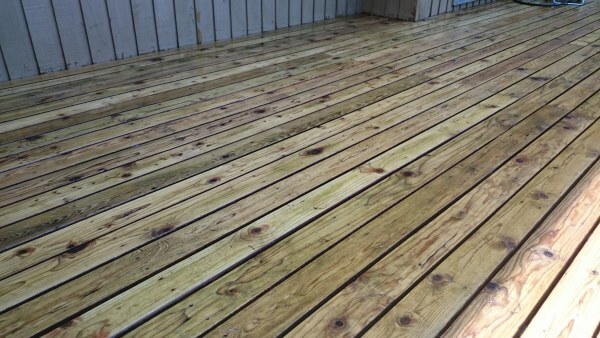 Also, paint cover so many wood problems so it’s tough to say if your deck boards could be saved or need to be replaced. Most of the time you need to go with deep sanding to get rid of existing paint. First step – Chemical washing. 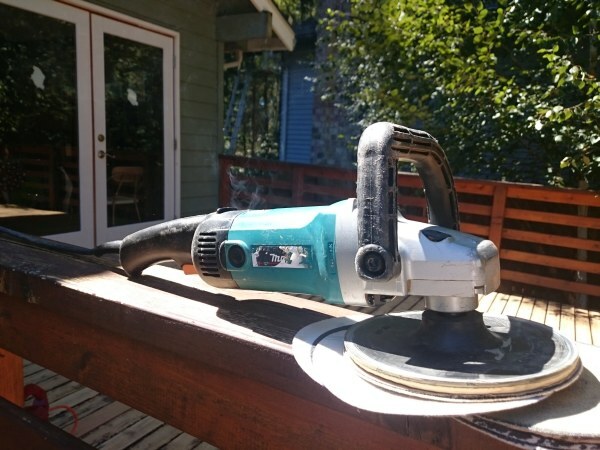 If you’ll do deep sanding on the deck you can skip this step, but for us it was interesting how much paint we can strip using our commercial grade stripper. Us you can see a lot of loosen paint pilled off after chemicals plus pressure washing. Now we need some dry weather, which is not happening very easy on the North West. We had an interesting project this May. The homeowner used a stain from one of premium names in color Driftwood. Although he applied it correctly, and had done a lot of wood preparation, the stain start pilling after less then one year. He decided to call professional woody. The Driftwood is not very popular among homeowners, and it was a big pleasure to work with this product. We were able to completely strip all surfaces and apply great product almost the same color.